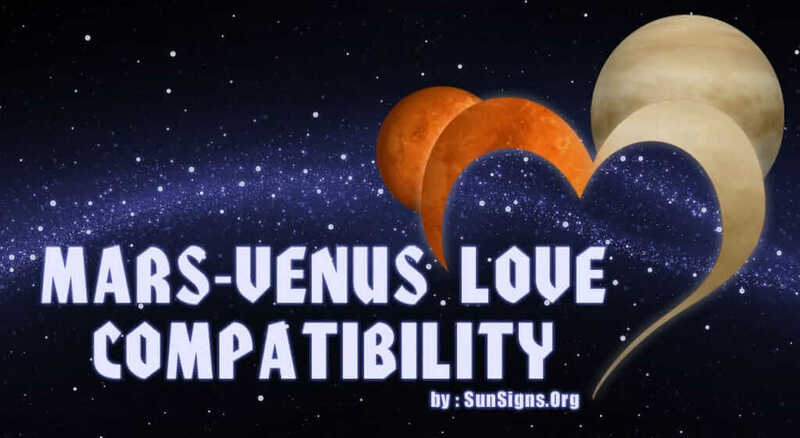 The Mars Venus Compatibility Test is designed to let you see the degree of physical connection between you and your partner based on your Mars and Venus signs. While this is not the only element that goes into making a romantic connection work, it does play a role in a couple’s happiness. This love test is quick and simple to interpret and take. The spontaneous nature of a new romance means that we often do not consider the degree of compatibility between the two persons involved. The idea seems preposterous to us. But a lack of compatibility between the partners can spoil the relationship. A good degree of compatibility can build the bond between the individuals into something stronger. One can get an idea of the degree of compatibility between people through the use of zodiac signs and other astrological elements. In 2017-2018 all of us are seeking to find a happy relationship. Our current mode of life is not particularly conducive to getting to know new people. So discovering a little bit about the type of person who might be compatible with you can aid you in looking for a life partner. There are so many facets when one looks at romantic compatibility. An important possibility is where Mars and Venus are placed in your natal chart. This will help in physical compatibility in your relationship. By using the birth chart calculator you can quickly discover the locations of Mars and Venus in your chart. To get the most accurate reading you need to know both the time of birth and the place of birth. Mars and Venus by themselves will not ensure a lasting relationship or even ensure that the relationship will begin. Though the physical side of a relationship may be successful, it may not guarantee a long-term connection. Other factors can influence the failure of a long-term relationship. Your Mars sign is your drive; the drive to win, to get what you want out of life and the way you go after what you want. For a man, Mars represents his masculinity. Mars in a woman’s chart is also representative of physical or sexual drive but also shows what she finds attractive in a man and how she expects her ideal mate to act. Mars tends to be selfish; Venus tends to want to please. In relationships, for a woman the Venus sign represents your feminine appeal, beauty, the way in which you give love and the relationships that please you. In a man’s chart Venus shows the type of woman he will be attracted to. This is why the Mars Venus calculation is relevant to love compatibility. No matter what stage you are at in a romantic relationship, if new or ongoing, the Mars Venus Compatibility Calculator will let you see the level of compatibility between yourself and your partner. What is the point of checking if you are already involved? If there is dissatisfaction between the couple, or the relationship is no longer happy, this compatibility test may help you find a way to work around problems. This will allow you to revive and continue to enjoy your relationship.